Japanese Episode DP 037: "Hakutai Gym! (Satoshi) vs. Natane!!" American Episode 501: "The Grass Managerie!" The day of Satoshi's second Shin'ou Gym Battle has arrived! After having the rules of the battle explained to him, Satoshi calls out his Naetle to face off against Natane's Cherrinbo. The Gym Leader's pokemon is very fast, thanks in part to the sunny weather, so Satoshi switches out his Naetle with his Mukubird. Luckily for Mukubird, the sun is eventually obstructed by a group of passing clouds, enabling it to avoid Cherrinbo's attacks and launch some counterattacks of its own. Eventually, the bird-type pokemon wins, forcing Natane to call out her Naetle. Mukubird is able to get a few good hits in, but after it is binded by Naetle's Leech Seed attack, the grass-type pokemon is able to gain the upper hand. Mukubird faints, so Satoshi calls out his Naetle again. The Gym Leader's Naetle performs the same Leech Seed attack on Satoshi's Naetle, but it is not enough to defeat its opponent. After using Synthesis to recover all its lost stamina, the challenger's Naetle tackles Natane's pokemon. The Gym Leader's pokemon faints, leaving her with one last fighter: Roserade. Roserade makes quick work of Satoshi's weakened grass-type by using Weather Ball, an attack that turns into a fire-type attack during sunny weather. Next, the young challenger calls out Aipom. 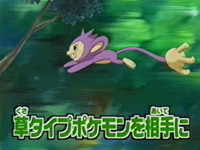 The monkey pokemon is able to dodge Roserade's attacks until its opponent uses Flash, an attack that temporarily blinds its opponent. Luckily, Aipom is able to detect Roserade's attacks with its sense of hearing and is able to pull through with a victory. Now that Satoshi has beaten all of Natane's pokemon, he is awarded the Forest Badge! When the first Gym Battle episodes were airing in Japan, fans were worried that for every Gym Battle we see, we'd have to watch each battle twice; once with Shinji as the opponent, and again with Satoshi as the opponent. And, if the anime writers really hate us, a third time in case any rematch is needed. The idea that we would have to sit through the same Gym Battles over and over and over isn't appealing, but luckily, this is not going to be the case. I'm glad Satoshi got to defeat Natane on his first try. We're already thirty seven episodes into the series, so we're well overdue for another Gym Badge. For comparison's sake, Satoshi had six badges 37 episodes into Kanto, two badges 37 episodes into Jouto (and was well on the way to his third), and two badges 37 episodes into Houen (with only three episodes until he got his third one). As things stand now, Satoshi's journey in the Shin'ou region is going to be the longest one yet, so the last thing we need is a bunch of rematches. As for the episode itself, I have no complaints. Shoot, even the Rocket-Dan subplot, which tends to be pretty useless in episodes like this one, proved useful. Whoever got the obvious yet brilliant idea to have the Rocket-Dan, the masters of digging, be the ones to discover the Shin'ou Underground deserves a pat on the back. The dubbed version continues to disappoint in the music department. We only get seven pieces in this one, and a scene that relies on silence to make an impact has music blaring all through it. I'm talking about the part where Aipom is listening out for Weather Ball. In the Japanese version, all we hear is Aipom's voice and the sound effect of the Weather Ball closing in. In the dub, however, we get the same generic PUSA music droning on and on, ruining the impact of the scene. What is it with anime dubbers and their tendency to eff up great scenes by slapping inappropriate music over them? In other dub news, Gardenia's voice actor still can't act. And is it me, or does it seem like PUSA is trying to phase out the 4Kids music in lieu of their own homegrown stuff? My favorite dialogue in the episode (if not the entire series thus far) is changed in the dub for obvious reasons. Here's a side-by-side comparison...my translation of the Japanese version is on the left, while the dubbed conversation is on the right. Meowth: "Hey! Where are we?" Musashi: "Maybe we dug too far and made it all the way to Hell?" Jessie: "For a grass-type Gym, it's a little light on grass." Kojirou: "This place seems to be a bit different than Hell..."
James: "Maybe they're conserving water." So yeah...we all know why the dubbed version was changed. In Japan, casually mentioning things like "Hell" isn't as taboo as it is in the States, so for them, it's nothing out of the ordinary. It would have been cool if PUSA had worked around it somehow ("the underworld" and "Hades" are two TV-Y7 FV friendly alternatives), but I knew they wouldn't and would opt to just do a complete rewrite instead. The motto in the Japanese version is different as well. I'm not able to make out the whole thing, but they do mention "Delivering "dangerous" to the depths of Hell" (usually, it's "Delivering "dangerous" all over the world!") and "Conveying "crisis" to Lord Enma!" (which is usually "Conveying "crisis" to the depths of space!"). All this religious stuff is, of course, removed from the dub. This episode does not have any edits done to the TO BE CONTINUED... screen! That's right! The final shot of the episode is the same length in the English version as it is in the Japanese version. While it was never a big deal that Pokémon USA would artificially lengthen the final shots of the episodes, it's still nice to have one less edit to report.